At Windham Wines and at home, we are celebrating having made it through the longest month of the year– January. It is longer than any other month, isn’t it? It is, at least, darkest. We have turned that corner. Winter is officially more than half over (though not really in Vermont) and importantly, days are finally getting longer. We have a new wall at Windham Wines. The door between us and the former North End Butchers has been removed and replaced by a solid. Customer/friend/painter Greg Moschetti has graced Windham Wines’ with some of his evocative landscapes. We hope you like them as much as we do. They could even go home with you after a little conversation with Greg and the transfer of some of your liquidity. We will have a new neighbor very soon– Curves, an exercise studio for women. It will be nice having others around again. There are additional positive developments afoot; none involves a butcher. We are still very interested in putting together a collaboration of complementary “sense of place” businesses. If you know of a butcher, a coffee roaster or barista, a baker– particularly boulangerie or other food-related entrepreneurs, please send them our way. The tasting team has been very busy. With their help and your input (we use that old-fashioned data that never lies–demand, measured by sales), we are constantly trying new items against what we have carried within a region, particularly as vintages change. As we mentioned in the last email, this is one of the ways in which we are different from the grocery stores, the New Hampshire state liquor store or many of the other places at which wine can be purchased. In effect, we curate a range of wines based on our conversations with you, your expressed interests and what is available to us. We taste the possibilities and try to select the best choices at different price points. We wish the wines were less expensive, but when we taste many of those, they really just do not make the cut. We taste within categories, so we are comparing similar things. Most recently, we tasted 11 Chiantis side by side. We found some great ones. One of the team’s favorites, the 2015 Selvapiana, Chianti Rufina, is described below. You are not going to believe it; we are busy buying rosé too! A reminder that we are trying wine clubs at Windham Wines. 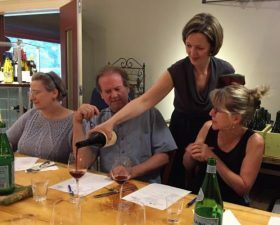 The Terroir Club (anything goes– sparkling, white, rosé, red) made the minimum, but the Vineyard Club needs 4 more interested takers. Back to demand, . . . if it is not there, we don’t need to do it! We look forward to seeing you soon. We appreciate the effort you make to shop with us. Thank you. In our last email to you, we introduced our wine clubs: Terroir, wines for those interested in all styles of wine– red, white, rose, sparkling, and Vineyard, a reds-only option. For $60 per installment for 6 installments over the year, those who join would receive 2-3 bottles every other month (Feb/April/June/August/Oct/Dec) for which we provide notes giving you the stories of people and place as well as suggesting food pairings. We allowed that we needed a minimum of ten of you to join each “club,” to make it fly. Terroir reached that goal, but so far, Vineyard has not. If you are interested in either, you can still join. The Terroir wines are in the shop and the notes are done. Give us a call at the shop to join (802) 246-6400. For Gruner fans, this is a must try. The 2014 vintage was charitably “very challenging.” Rain for weeks began in mid-August, leaving grapes that were unripe, diluted and susceptible to botrytis. Meanwhile, it was wedged between two of the arguably greatest Austrian vintages– 2013 and 2015. You can imagine my disappointment to see the 2014 at a recent industry tasting. And guess what? I found myself smitten. The wine has green notes, yes, but pleasantly and very Gruner-expected. Weingut Hirsch’s farm/vineyards are in Kammern, in the Kamptal (Kamp River Valey) at the base of two hills, Heiligenstein and Gaisberg, known as the Grand Crus of Kamptal wines. Johannes Hirsch believes that the “soil makes the wine,” even more than the grape variety. 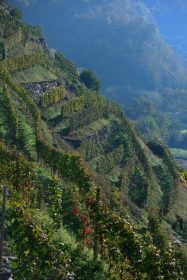 Hirsch makes only Gruner and Riesling because the myriad vineyard sites generate a nearly limitless expression between them. More than sugar levels, Hirsch wants healthy fruit, which is why he farms biodynamically. His healthy soils enable his grapes to reach physiological ripeness earlier than others, allowing him to pick much earlier than his neighbors. This philosophy no doubt saved his 2014 vintage. For those of you who like acid (it is, after all, a very food-friendly quality), and who want to taste a bit of green peppercorn, parsley and lime balanced by minerality, try this wine. It would be fun to open it with one of our 2015s (Tegernseerhof, T-26,) or 2016s (Steininger, also Kamptal). It is $2.00 less than usual too. It’s not often that we get excited about domestic Pinot Noir that is under $20 per bottle, but we are definitely keen on the Straight Shooter. A second Oregon label for Maison L’Envoyé, the Straight Shooter is a blend of Pinot Noir from both volcanic and sendimentary sites from the sub-Willamette AVAs of Eola- Amity and McMinnville. 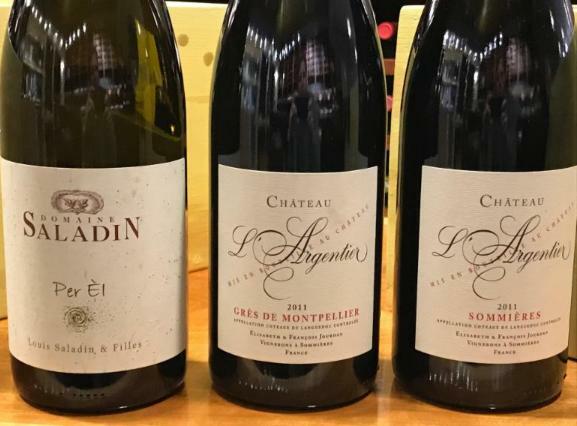 Grapes were hand-harvested, 80% destemmed, fermented with indigenous yeasts in stainless steel, then aged for a year in French oak, only 10% of which is new. The 2016 reflects the ripeness of the vintage. There is plenty of fruit here, from blueberry to dark cherry, along with a smoky peat undertone and a bit of spice. The mouthfeel is full, then balanced by some finishing acidity to lift the cherry-dried cranberry fruit and lingering baking spice notes. 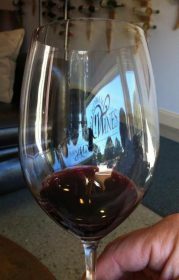 It is unmistakenly Oregon, and undeniably a top value Willamette Valley Pinot Noir for 2016. This was the tasting team favorite during our Sangiovese tasting last week. For those of you who have enjoyed this wine over the years, let me say that after a the discouraging 2014, this wine is back. Rufina is a Chianti region just east of Florence in the foothills of the Apennines that separate Tuscany from Emilia-Romagna. It is a cooler microclimate that allows the Sangiovese to retain its freshness, even during warm years like 2015. Several years ago, Frank and I spent a morning with Silvia Giuntini-Masseti at Selvapiana. Silvia and her winemaker-brother, Federico, are the adopted children of former winery owner and their uncle, Francesco Masseti-Antinori. Their father, Franco Masseti, was the vineyard manager for Francesco until Franco’s premature death in 1990. While still children, Silvia and Federico were adopted by their uncle. Our time at Selvapiana was one of our favorite experiences of all the wineries we have visited over the years. Everything about the visit was authentic. The estate was unpolished but clearly home to Federico and Silvia, her husband and their children. While there were stainless steel tanks in the “new” cellar, there were more large, historic vats in which the greater part of the wines were aged in the old cellar. Dusty bottles dating back to the 1940s were stacked in various bins throughout the old cellar. Silvia and Federico were, at the time, the only full-time people. The wines spoke of place, Sangiovese with cherry, tobacco leaf and spice, with that beautiful energy at the end. It is there again in the 2015. We welcome back an old friend, and enjoy the fond memories that the wine evokes for us.